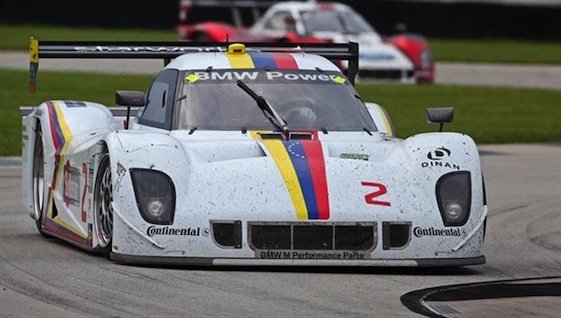 Daytona Prototypes using the new 4.5-liter BMW engine have been ordered to scale back power. The Grand-Am Rolex Series on Monday released a technical bulletin announcing that its officials have taken steps to scale back the power of the recently introduced 4.5-liter BMW Daytona Prototype engines. The scale-back comes in a form of limiting the new engines – which powered the cars that placed first and second at the Brickyard 400 two weeks ago in their racing debut – to 8,050 RPMs. That is a reduction of 150 RPMs. Drivers and team owners utilizing non-BMW engines complained to RacinToday.com last week about new engines. Michael Shank, the owner of Michael Shank Racing whose cars run Ford engines, was very concerned about the new M-3 based BMW engines when he visited Kansas Speedway last week. Shank said he believed that the power numbers which BMW submitted to the series on the new engine might have been off. He said he would take his concerns to series officials. His plea was not to allow other engines to increase their power, but to scale back the new BMWs – which were smaller in terms of displacement – but were more powerful. Shank contended that the older, M-5 based, 5.0 liter engines were already more powerful than the others on the track. Max Angelelli, who drives a Chevrolet Corvette for Wayne Taylor Racing, told RacinToday.com that the Chip Ganassi Racing team, which has been using Steve Dinan built BMW engines and winning championships with them for several years, is very adept at playing games with rule makers. Grand-Am released news of their decision Monday without comment.